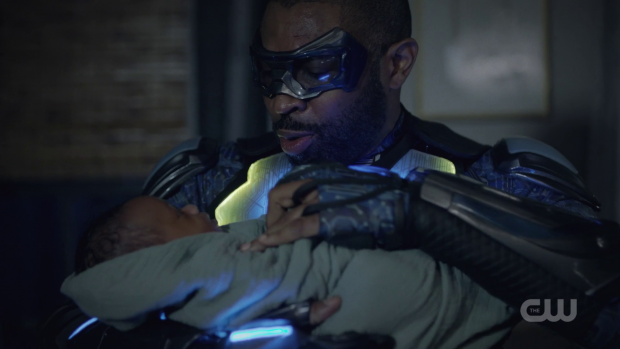 Black Lightning continues its excursion to the world of South Freeland as Khalil makes a very risky decision that could have severe consequences for him. The introduction of South Freeland last week was a great opportunity to expand the world of the show by establishing two compelling warring factions as well as a theatrical villain who could prove to be an appropriate match for Jefferson and Anissa. It’s somewhat disappointing that this episode appears to put an end to everything that was established which makes South Freeland feel more like a distraction from other goings on than an organic part of the overall story this season is trying to tell. None of this means that the episode was bad and it’s very possible there is a larger plan that makes the abruptness of this two part story feel more worthwhile but it’s hard to call it entirely satisfying. Arguably a departure from the intensity of the main plot threads could be a good thing though the placement of this is jarring. As I said, this doesn’t make the episode bad. It’s actually very good and a refreshing departure from the usual Black Lightning style to deliver something a little more tradition in terms of superhero stories. Is it the right time in the season to do this? Probably not but what was on display was really well done. Taking time to explore Looker was one of the highlights. Sofia Vassilieva remains endlessly watchable and the character is wonderfully unhinged to the point of near cartoonish villainy which itself feels at odds with the usual style of this show. Her brief conversation with the captive Jefferson tells us a lot about her and her motivations. She admits that she is basically a Black Lightning fangirl who has admired him from afar for years and modelled her own crusade after him. According to her they have so much in common because they both fight for the good of their people and are willing to sacrifice themselves for what they consider to be the same people. Of course her viewpoint is completely askew as she finds ways to justify killing and is casually racist as well. She sees no difference between wearing a t-shirt declaring pride in being black and wearing a t-shirt declaring pride in being white which shows total ignorance to historical context and what that means. Amusingly she accuses Jefferson of having “minority privilege” because he doesn’t see her point of view. One of the best things about this interaction is the contrast between the conviction behind her words and Jefferson not taking her the least bit seriously. All he sees is an insane villain that he needs to take down. 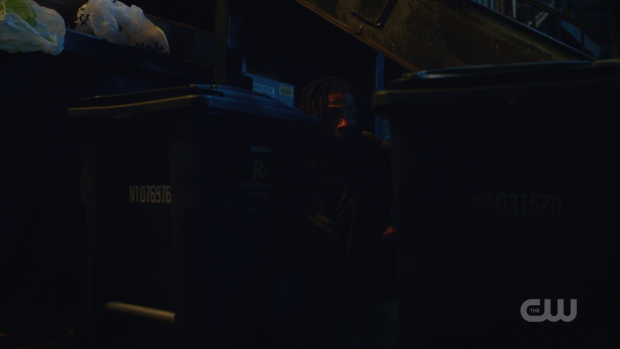 The early part of the episode sees Jefferson held captive but he’s playing possum to get inside the compound, assess the numbers that he’s dealing with and find the child. Looker and her people fall for his deception and even electrocute him as a way to hurt him failing to consider that a man with electrical powers would thrive on that. For some reason they assume the costume is the source of his power which allows Jefferson to completely control the situation. Such incompetence should be a flaw in the episode but it’s handled so well that it crosses the line into entertainment. A large part of that is down to how Cress Williams plays the scenes and some of the comedy around him once again knowing when to punch someone moving at super speed. As this is going on, Anissa and Lynn help Anaya with her baby with Anissa being around to offer super powered protection. It’s clear that Looker will be coming for the other child so the plot reason for them hiding out in the Mall is to prepare themselves for that as much as possible. It also serves as a reminder that the silver liquid is drawn to the baby for reasons that aren’t yet made clear. On a character level this is a great opportunity for Anissa and Lynn to spend some time together. Having two mother/daughter pairings in the same room naturally allows this relationship to be given some attention just as Anaya adapts to the idea of being a mother and learns what it means to fear for the safety of her children. For Lynn this is a chance to help an innocent child which may offer her some comfort after the part she played in the fourteen deaths. The Anissa/Jefferson relationship also receives some attention. There is still tension between them which adds more weight to their interactions while showing their ability to be professional even when they don’t see eye to eye. A role reversal of sorts is in play with Anissa practically pleading with Jefferson to be more cautious which is counter to her own instincts. Being reckless isn’t unheard of for Jefferson but he is more likely to take more care in approaching a situation. On some level it shows the beginning of acceptance of the viewpoint of the other and could be the start of them reconnecting. Looker and the Sange’s attack on the Mall to take the child is an excellent sequence that relies more on combat skill than super powers though those were definitely in the mix. It reinforces the idea that victory comes to those who are better trained rather than those who are more powerful though it doesn’t seem like Looker’s abilities would be much of a match for Jefferson’s electric powers but her speed is a match for Anissa who isn’t as proficient at anticipating attacks as her father is.. This is probably why he shows up later to the fight in order to mop up the Sange to allow Anissa to deal the final blow to Looker. She is shown to have survived and Jefferson suggests giving her to the A.S.A. who will most likely run experiments on her but are also best equipped to contain her. This is yet another example of the moral complexity at play in this show as Jefferson’s only choice is to hand a super powered criminal over to an agency that aren’t exactly morally upright either. Anissa’s relationship with Grace makes a brief appearance showing that Anissa has made some sort of commitment to her while serving as a reminder of Grace’s manifesting abilities. She still appears terrified of what is happening to her which sets up a potential mirror between Grace and Jennifer who are at different stages of their journey but have broadly the same reaction. Anissa’s contribution will be likely in support of Grace embracing her abilities but it looks like Grace will reject them which will likely cause some friction between them as if there hasn’t been enough of that already. Jennifer takes a significant step forward in acceptance of her powers and her journey towards a hero. Granted she has a specific motivation to take that step after learning that Khalil is in danger. She risks her life to save him and reveals her powers to him marking an important progression in their relationship. 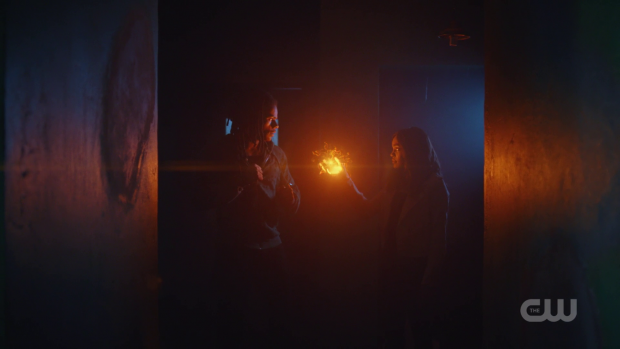 Jennifer showing him her powers puts them on an even playing field and opens up a new dialogue between them. They clearly care for one another and feel comfortable together especially now that there is complete honesty between them. Jennifer’s decision to run away with him makes sense as she currently can’t see past her desire to protect him as well as the feeling that he’s the only one who understands her at this point. It’s an intensified teenage problem that proves interesting because as smart as Jennifer is she is still prone to emotional reactions that blind her to what is best for her. Her earlier conversation with Perenna is all about her relationship with Khalil rather than helping her to control her powers. Perenna encourages her to talk to her parents about it but she feels that she is being punished for being born the way she is and isn’t being listened to. Jennifer recognises that her parents love her but for now the way she is being treated is suffocating her so she doesn’t want to add any extra reason for them to be overprotective hence why she keeps the Khalil situation a secret. Perenna has her confidence -at least in the beginning- so is able to offer impartial advice. One of Jennifer’s concerns is that she’ll end up hurting Khalil due to an inability to control her powers which is recognised as a concern though she is also more concerned about the fact that she might live her entire life without people truly understanding her. Khalil appears to be the only person who does, at least as far as she sees it so this entirely justifies her reason for leaving with him. Khalil’s decision to defy Tobias because he’s uncomfortable with killing for him proves that he’s a good person and that Jennifer is right to trust him but paints a target on both of their backs. Tobias is shown to be ruthless and unforgiving when sending out people to bring Khalil in so he can be the one to kill him. One thing’s for sure, when Tobias catches up to him the end result won’t be pretty. Perenna’s conversation with Jefferson and Lynn serves as a warning about their current approach with Jennifer as they risk pushing her away if they don’t change up the way they treat her. Included in this is a warning about Jennifer’s powers; apparently Perenna has never encountered anyone as powerful as Jennifer is so if they push her away then she could end up being a danger to herself and others. This is clear foreshadowing of a future problem to play out and Erika Alexander’s performance brilliantly sells how serious the warning is. Jefferson learns that Gambi is alive which makes his apparent death even more pointless as the show hasn’t really done anything with it. Having said that their reunion is a wonderfully written and acted character driven moment that highlights the complexity of their relationship. Jefferson pulling him into a hug indicated the strength of the emotion in that moment as well as the relief that Jefferson hadn’t lost the closest thing in his life to a father. If there was a better use of his apparent death than having him sit around spying on people it would have worked a lot better but their scene together almost makes it worthwhile on its own. A solid episode that entertains in the execution of a plot outside of the usual style of the show but disappoints in abruptly closing the South Freeland story. The interaction between Looker and Jefferson makes for great viewing thanks to the charisma of Sofia Vassilieva and how clearly delusional Looker is as a character. Revealing that she’s a Black Lightning fangirl who doesn’t understand what he stands for despite modelling herself after him is hilarious and Jefferson reacting by not taking her at all seriously is perfect. Cress Williams’ performance throughout his false captivity and escape helps make it all the more entertaining. Anissa and Lynn helping Anaya allows for some attention to be given to their mother/daughter connection while giving Lynn the opportunity to help an innocent person after her recent failure. The resulting action sequence is really well choreographed and makes great use of the different skill levels before capping it off with a reminder that not every answer is simple in this show when Jefferson hands Looker over to the A.S.A. Grace’s powers manifesting as she tries to hide them mirrors Jennifer’s reluctance to accept her powers even if they are at different stages. Anissa will likely encourage Grace to embrace her powers while Grace will clearly be reluctant. Jennifer’s conflicted feelings over Khalil are largely resolved when she finds out he’s in trouble and rushes to help him while revealing that she has powers therefore putting them on an even playing field. This gives Jennifer the feeling that someone finally understands her; something she has been lacking from her parents and their relationship becomes stronger as a result though there is the hint of danger associated with the approach her parents are taking to dealing with her that will surely be developed in the coming episodes. Khalil’s decision to defy Tobias proves that he’s a good person at his core so it’s at least safe to assume that trusting him is the right choice for Jennifer. Jefferson learning Gambi is alive renders his fake death largely pointless as it accomplished very little but it does lead to a powerful reunion scene between them that highlights the complexity of their relationship.